Because I am a very, very, extraordinarily lazy gardener, I just got around to bringing my pots and things in the garage today. This is something I really should have done a month ago, since almost everything out there was long since dead. I tossed some parsley seeds in my pot of dill last spring. The dill is long gone, but the parsley keeps on trucking. 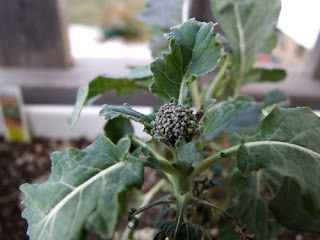 I didn't bring in the broccoli with my original group, because it looked pretty scraggly, and at that point in time the buds were tiny (popcorn kernel sized) to nonexistent, so it didn't seem worth it. Now some of the buds are as wide as a quarter--and this growth occurred since the beginning of October. During which time the temperature has dipped down to the teens (possibly the single digits) and we've gotten a few dustings of snow. The air temp was about 30F when I was outside today, and the soil in the pot was frozen solid. But the broccoli leaves and buds were still green and pliable. I figured the reason that they never did much this summer was because I planted them too late, and the heat of summer came too quickly for them. Most cruciferous veggies prefer cooler weather. "Below freezing" is pushing it a bit, though. So, since they were not only still alive, but putting out flower buds, then of course I have to bring them inside. So the indoor winter garden experiment continues. Very interesting about your broccoli. I may try leaving mine outside longer next year. They were in a poor spot this year, overshadowed too much by the greenhouse my husband and his friends built right beside them. 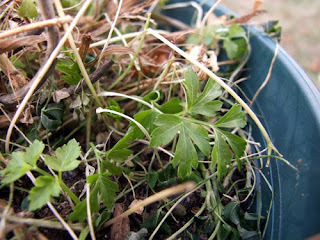 I've never considered digging up and overwintering my geraniums. All my plants were in pots this year (I'm in an apartment and my landlord won't let me dig up the yard) so it was easy to bring stuff inside when the temps dropped. I've heard that geraniums are really easy to overwinter, but this is my first year attempting it. SuperSonya, how can I put a picture of my mystery houseplant on this blog? I want you to see my Flying Fish Flowers! Hey, Q. I got your e-mail, and your flying fish is amazing! Congrats on successfully moving most of your plants--and keeping two miracle snails alive. I've accidentally brought in caterpillars, and of course there's always ladybugs in the house, but I've never had indoor snails.